In the opening minutes of Billie August’s Pelle The Conqueror, which won the Palme D’Or at Cannes in 1988, a rickety boat bobs out of a thick blanket of fog and into view. Aboard this seafaring vessel, weary travelers huddle close for warmth and comfort; one of them, an aging Swede played by veteran actor Max Von Sydow, whispers to his adolescent son, Pelle, of the bright future that awaits them in Denmark. “They put raisins in the pork roast,” he says, adding, “The brandy is cheap as water.” All of that sounds a bit too good to be true, and sure enough, the remaining two and half hours of running time seem designed to rebuke Von Sydow’s fantasy of a new world. No sooner have they stepped onto the dry land of Bornholm, the Danish island where the man and his boy hope to start fresh, than prospective employers are dismissing them as too old and too young, respectively. By nightfall, the promise of a promised land has almost completely evaporated: The two lay awake in a barn, among cows and chickens, flies buzzing around their heads, an early morning of back-breaking farm labor ahead of them. Welcome to Denmark. Part 19th-century immigrant story, part grim coming-of-age tale, and all depressing, Pelle The Conqueror piles on the hardships. The cruelty comes from all sides, meted out by a fascistic foreman (Erik Paaske), indifferent teachers, and preteen oppressors in training. Along the way, the film’s young hero will lay witness to a drowned infant, a suicide (of sorts), even a bloody castration—and, notably, that last act of violence is arguably coded as poetic justice. Pelle belongs to a long tradition of hard-knock-life Cannes winners; historically speaking, harsh truths and visions of despair go over well on the Croisette. Yet August’s languid downer is also one of a modest number of Palme winners that found additional success in the States. After earning the top prize from the festival jury, an eclectic group led by Italian filmmaker Ettore Scola, the movie went on to claim Foreign Language awards at both the Golden Globes and the Oscars—a hat trick that wouldn’t happen again until this year, when Amour picked up those same three honors. Pelle also made a cool $2 million at the U.S. box office, which ain’t too shabby for a lengthy Danish drama. What could America and its awards groups have seen in such a litany of sorrows? Visually speaking, the film is handsome (if unadventurous), its images of dirt and squalor offset by the sometimes-majestic landscape. There are green pastures, vast expanses of blinding-white snow, and a shot of Pelle running down the beach, the crashing waves of a mighty ocean framed behind him. August, who would win another Palme just four years later for The Best Intentions, makes the kind of noble, serious, often uncomplicated pictures that go over well with the Foreign Language committee of the Academy. That’s not a slam on him, especially in regards to Pelle: His approach, which rarely allows for showboating, is well suited to a sobering portrait of hard living. All that misery just happens to go down smoother when wrapped in the familiar trappings of prestige cinema. The film thus falls in the middle circle of an odd Venn diagram, uniting art-cinema masochists—again, there’s a castration scene here—and folks whose interest in international cinema begins and ends with Oscar’s annual foreign-language slate. Then again, perhaps the real secret to Pelle’s demographic-crossing appeal is the presence of the great Von Sydow, an actor revered enough to command one of those boxes around his name in the credits (a strange and tacky tradition that you rarely see anymore). His face beet red, from the sun or the sauce or both, he turns his drunken, defeated patriarch into a truly tragic figure—a man who wagered everything on a better tomorrow and lost. (His spirit is more or less broken from the second scene, which begins with him confidently declaring that he won’t take the first job offer he gets and ends with him taking the first job offer he gets, but mumbling the same promise under his breath.) Von Sydow is capable of exuding dignity even when his character is being constantly robbed of it, which makes him among the most humane performers in cinema. He’s truly heartbreaking here, grumbling about the respect he’s constantly denied and trying to stand up for his bullied son, but finding himself too weak—in body and constitution—to do so. Check out this passage, which operates as a kind of microcosm for the whole film and clearly demonstrates the character’s failures as a protector and role model. So affecting was Von Sydow in the part that he was able to overcome the Academy’s historic bias against non-English-speaking performers and score a Best Actor nomination. In truth, though, that’s something of a cheat: Though it dominates the movie, his is clearly a supporting performance. The lead here is the boy, who appears in close to every scene and whose perspective the film essentially adopts. He’s played by Pelle Hvenegaard; yes, the kid was actually named after his character, a pretty good indication of how influential the novel is in its native Denmark. Hvenegaard is of the naturalistic school of child stars, conveying the innocence and wonder of youth without ever really seeming like he’s acting. I wish, though, that his Pelle was allowed to be a more active participant in his own story. Last month, in this same space, I wrote about Rosetta, another film with an eponymous, impoverished young protagonist who’s dragged through the dirt on a daily basis. The difference, beyond a much more manageable 95-minute running time, is that Émilie Dequenne’s perennially unemployed teen tackled her difficult existence head-on, like a soldier charging into battle. Hvenegaard’s urchin is more of a blank canvas on which an uncaring world splashes its tough-love lessons. He just kind of absorbs. That, of course, is largely the point. Pelle The Conqueror is the story of an education; its drama stems from what the boy learns through observing, so his passivity makes sense. (Also, he’s at an age when kids have little control over their fate anyway.) In the scene below, Pelle dabbles in exploitation, finding out what it feels like to be on the other end of the whip and to bend someone’s will with the promise of money. As an adaptation, Pelle The Conqueror tackles only a fourth of its source material—the opening section, Boyhood—and that may be the film’s great shortcoming. In Nexo’s book, Pelle grows up to be a labor leader, which gives many of his experiences on the farm retroactive significance. One could argue that the movie is attempting what Walter Salles would later aim for with The Motorcycle Diaries: a pinpointing of the seed of dissent, an origin story of a great leader in which the gravity derives from who this unshaped figure will become. That works, in theory, for Che Guevara—I’m not convinced the Salles movie pulls it off—but for it to work here, the audience needs a familiarity with Pelle’s complete arc. Seen out of context, the film ends up playing like either the protracted, isolated first act of an incomplete epic or a hardscrabble-youth story stretched to its near-breaking point. Did it deserve to win? Sometimes powerful but rarely transcendent, Pelle The Conqueror feels, honestly, like a compromise pick among stronger, stranger contenders. The jury was the usual grab bag of international artists, impossible to connect with a through-line of shared interests. (Its ranks included Australian genre maverick George Miller, Berlin-born actress Nastassja Kinski, and British film critic David Robinson.) Trying to ascribe motive to their decisions is perhaps futile, though one can see how Pelle might appeal to Scola (whose professed love of Italian neo-realism could lead him to champion a working-class drama) or American screenwriter William Goldman (who’d maybe appreciate the film’s classical construction and interwoven plot strands.) What’s more likely, perhaps, is that the group split its passion among the more divisive competition titles; Pelle, which could only really offend those with a low tolerance for miserablism, might have looked like a choice with which everyone could live. But what of the other films? Clint Eastwood’s Bird, which applies a jazz-like structural gambit to the life of legendary saxophonist Charlie Parker, must have had its fervent defenders. 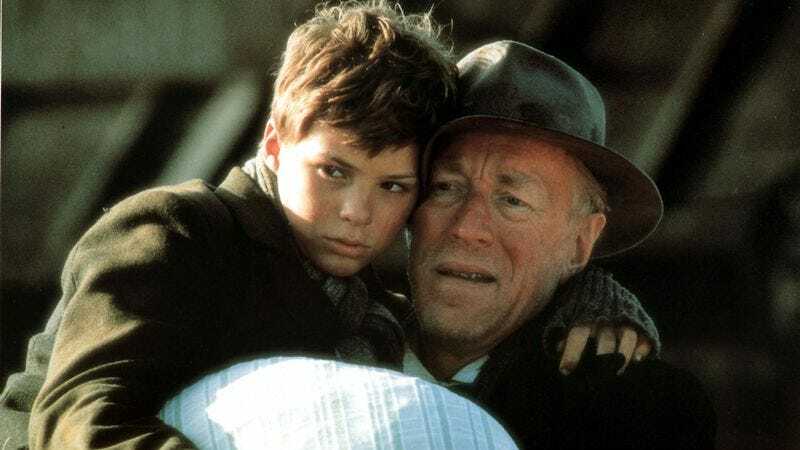 In a minor upset, Von Sydow lost Best Actor to Forest Whitaker, who plays “Bird,” though that might have just been an attempt by the jury to spread the wealth. It’s not just a worthier winner, but one of Eastwood’s strongest movies. For conceptual daring, another biopic, Paul Schrader’s flawed but fascinating Patty Hearst, deserved some attention; it’s told exclusively from the kidnapped student’s perspective, which means large portions of the film’s first half take place in the dark room where she was imprisoned, illuminated by narrow shafts of light. As a Claire Denis superfan, I’m also inclined to stump for her debut, Chocolat, though the great director’s elliptical style hadn’t quite ripened at that point. All those films would have made fine alternatives, but the Palme really should gone to Krzysztof Kieslowski’s gripping A Short Film About Killing, which he expanded from the fifth episode of his Polish television miniseries The Decalogue. Just as bleak as Pelle, but with a much more direct political agenda—it’s staunchly anti-death penalty—the movie is the exact sort of world-cinema cherry bomb Cannes should be helping to lob. Tellingly, it did not win an Oscar.